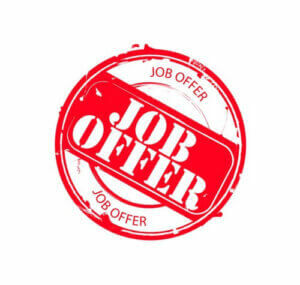 Retro red round rubber stamp “Job Offer”. Photo courtesy of Shutterstock. Congratulations, new job seeker! After all of your hard work in your job search, you have finally landed an offer. Even though you are happy about that, there are some things you may want to consider before accepting a new position. People – Who will you be working with? In order to be productive in the workplace, it is essential to get along with your boss and your colleagues. Understand that everyone on the job does not have to be your best friend. Just be professional by treating everyone the way you want to be treated. Company culture – The company culture has to do with being the right fit in a certain environment. How does the company do business? Consider whether or not it has morals and values that you can support. Most importantly, decide if you will be comfortable working for a particular employer. Compensation – Do some research to find out what is the average salary for a position, for example an entry level job. Beyond salary, see if there are any perks that come along with the job. Some extras might be enough to sway you to accept the position, even if the pay is not quite what you were hoping for. Career development – If you accept a new job, will it allow you the opportunity to grow? When talking to a potential employer, ask if the job will prepare you for career opportunities. Also, find out if there are any classes or training that are part of this process. Stability – Depending on where you are at in life, stability may or may not factor in your decision to accept a job. However, who would not want to work some place with a solid organizational structure and typically knowing what to expect on a daily basis? When you work in a secure environment, it gives you peace of mind so that you have the chance to be the best worker possible. Once you have received a job offer, it can be tempting to accept it right away. However, the job may not be what you think it is. Make sure to take some time to consider the factors that were mentioned so that you make the best decision when it comes to employment.